The research group on Quantum Information and Computation, at the Universidad Politécnica de Madrid (UPM), comes from a different background. The core of members is formed by associate professors from the UPM, skilled in the areas of applied mathematics, networking and computational sciences, among others. The first QKD network (2009-12) was unique in that it departed with previous thinking about QKD networks in not relying in intermediate trusted nodes connected through non-shared optical fibres. This was tantamount to have a separate, ad hoc network for the quantum signals alone. The network sought a full classical and quantum network integration by using the usual core and access architecture of a metropolitan area network. Standard, off-the-shelf, components were used to research the limits of quantum-classical coexistence in a CWDM metro area core network and using a GPON access network. The objective was to study the limits in stablishing a quantum link crossing a full metropolitan area network using standard components and sharing the already deployed optical infrastructure [Lancho et al., 2009 ] (see Video). The second QKD network prototype (2012-2015) was less concerned with the coexistence of classical and quantum signals and sought to maximize the number of users in a quantum network. In this network, the classical signals were, at first, limited to those needed to keep the quantum channel stable and to distill the keys in the QKD link. Finally, this limitation was also raised. 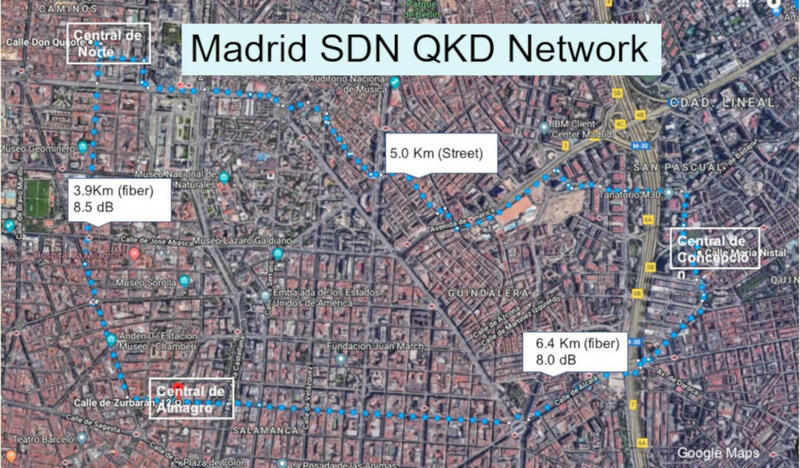 The result was a demonstrator were up to 32 QKD users could use simultaneously a fully addressable metropolitan area network (i.e., where any QKD device can decide with whom it wants to generate key) directly and without any trusted intermediate node. The network would, in an almost fully passive way, automatically direct the quantum and corresponding classical channels from the emitter to the receiver by using a mixture of CWDM and DWDM channels using standard components [Ciurana et al., 2014 ]. This network was also capable to distribute entanglement [Ciurana et al., 2015 ]. The third network prototype (2017-present), now in development, is researching the integration of QKD in novel network architectures, in particular using the Software Defined Networking and associated Network Function Virtualization paradigms. These new paradigms are designed for maximum flexibility by stepping away from proprietary appliances that work mainly as separated entities. Relying on as much common hardware as possible that is accessed through common interfaces, a logically centralized SW entity —the SDN controller— can manage the SDN network taking into account the peculiarities of all new hardware installed, as long as it exports the needed functionalities and the corresponding interfaces. In principle, this allows for a seamless integration and easy deployment of quantum communications over existing networks [Aguado et al., 2018.1 , Aguado et al., 2017.2 , Aguado et al., 2017.1 ]. The team members are also skilled in QKD post-processing and secret-key distillation, having proposed novel methods for efficient and high speed information reconciliation (error correction) in QKD. A. Aguado, V. López, J. Martinez-Mateo, M. Peev, D. López and V. Martín, “VNF Deployment and Service Automation to Provide End-to-End Quantum Encryption,” Accepted in IEEE/OSA Journal of Optical Communications and Networking, 2018 (PDF ). A. Aguado, V. Lopez, J. Martinez-Mateo, T. Szyrkowiec, A. Autenrieth, M. Peev, D. Lopez, and V. Martin, “ Hybrid conventional and quantum security for software defined and virtualized networks,” 2017, IEEE/OSA Journal of Optical Communications and Networking , vol. 9, no. 10, pp. 819-825, Oct. 2017. doi: 10.1364/JOCN.9.000819 (PDF ). A. Aguado, V. Lopez, J. Martinez-Mateo, M. Peev, D. Lopez, and V. Martin, “GMPLS Network Control Plane Enabling Quantum Encryption in End-to-End Services,” in ONDM 2017, 21th International Conference on Optical Network Design and Modeling, Budapest, Hungary, May 15-18, 2017. Best Paper Award (PDF ). A list of low-density parity-check codes and matrices particularly optimized for different coding rates and communication channels.